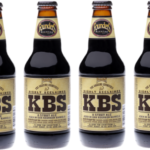 The hugely anticipated and special Founders KBS (Kentucky Breakfast Stout) will be available on tap at Growler & Gill on Saturday 4/1. Limited bottles will also be available. This special barrel-aged stout is a version Founders Breakfast Stout aged in oak bourbon barrels from Kentucky. We can not guarantee how long the keg will last!